“During the summer of 1997 The Times Magazine published John Woodcock’s personal selection of the 100 greatest cricketers in the history of the game. This immediately sparked a wide-ranging debate in the cricket world but it was universally agreed that no one was better qualified to undertake so daunting and essentially controversial a task,” said the back of the book that was published in 1998. Woodcock had covered over four-hundred Test matches for The Times alone. The innings was opened by W.G. Grace at number one and Donald Bradman at number two followed by Gary Sobers. For the batsman at number 25 Woodcock observed that he ‘has all the credentials to become one of the two or three greatest batsmen in the game’s history, as well as one of the most engaging’. “At Perth in Western Australia early in 1992 Sachin Tendulkar made a century for India against Australia on a lively pitch with a brilliance that no other batsman in the world could have surpassed. He was eighteen at that time—the prodigy of prodigies,” Woodcock wrote. Then he spoke about an innings in 1997 at Cape Town describing Tendulkar as a veteran of twenty-three and his country’s captain. He played an innings of 169 against South Africa that began in a crisis and lasted for five and a half hours and was virtually flawless. But only time will tell for how long he is able to withstand the pressures of being India’s leading batsman, the relentless idolatry that goes with it, and the worry of wondering, when he is captain and India are on tour, where their next wicket is going to come from. Time has only served to confirm that Tendulkar, even after 20 years on the road, still has the capability to produce a timeless gem. The few injury-marred Test seasons and the 2007 World Cup where he was, for reasons apparent to no one bar Greg Chappell, made to bat at number four rather than his favoured and successful position at the top of the order are among the major disappointments. Ricky Ponting did not make the cut as he was a late bloomer but Shane Warne, Brian Lara, Barry Richards, Sunil Gavaskar and Graeme Pollock along with other legends all found a rightful mention. On India’s 2009 tour of New Zealand, former Kiwi all-rounder Richard Hadlee called Sachin Tendulkar as the greatest batsman ever to grace the game. Hadlee, 57, who became the first official inductee to ICC’s Hall of Fame on the first day of the Wellington Test, said he was in awe of Tendulkar whose achievements down the years “clearly had been phenomenal”. Mike Atherton, in a November 19, 2009 piece for The Times spoke about the advent of the helmet and how it helped modern players and wrote that “to suggest that Tendulkar — or, indeed, any modern, armoured or, to use Vivian Richards’s phrase, “pampered” player — is the best ever is demeaning to those former greats who stood at the crease in the knowledge that their next ball could be their last.” Fair enough; but just one factor and not the factor that decides the art of batsmanship in its totality; a heavily padded and protected Mike Atherton averaged 37.69 and I don’t buy the argument that his average would have dipped dramatically if he came out without a helmet or gone up had he dressed like an astronaut. In all Bradman came to the crease in an international fixture a total of 80 times in one form of the game and scored 29 centuries with a phenomenal average of 99.96. 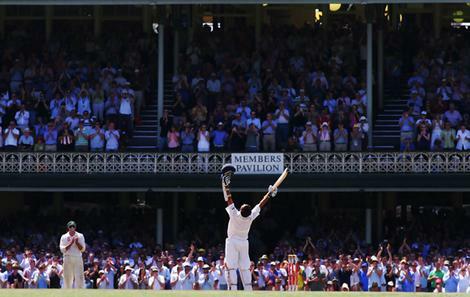 “Though his batting was not classically beautiful, it was always awesome. As Neville Cardus put it, he was a devastating rarity: ‘A genius with an eye for business,’” Matthew Engel is quoted in Bradman’s Cricinfo profile page. There is a lot more to cricket than just the helmet and those are also factors that need to be considered if any comparison has merit in the first place. The Don played his 52 Test matches against four opponents in nine grounds—five grounds in England and four in Australia. Thirty-seven of those 52 matches were played against England and 15 against the other three oppositions namely South Africa, West Indies and India all in his home conditions. Sachin Tendulkar played on 32 different Test match surfaces before he first played a Test match at a surface where he had played a Test before—the Wankhede Stadium in Mumbai. Sachin Tendulkar has played on close to 60 different Test match surfaces and the limited overs game has taken him to even more parts of the cricket-playing world. He may have come out to bat on 80 occasions in just about two or three seasons in the 1990s. From 1989 to 2000, Sachin Tendulkar played 79 Test matches and scored 6416 runs at an average of 57.28 with 24 hundreds. Ponting was a late bloomer; his 2001 tour to India was a very dismal one and his resurrection as a batsman began after it. In that tour Ponting scored 0; 6, 0; 0, 11 in five innings of three Tests. After that disastrous 2001 tour for Ponting his average in 42 Tests was a decent-but-average 42.96 with seven hundreds to his name while Tendulkar had 25. The comparisons of Tendulkar and Ponting began only in the years after 2002 and 2003 and then in the injury-marred period of Tendulkar; where he largely-remained stationary while Ponting had more than a few out-of-the-world seasons. In November 2002 Tendulkar was 19 hundreds clear of Ponting and in the period that followed and established Ponting as a modern great he made 21 hundreds as opposed to Tendulkar’s four and the gap was narrowed down to two hundreds. The gap stands at six today with Tendulkar at 45 hundreds and Ponting with 39; there is no comparison in the ODIs where Tendulkar leads with 45 hundreds and 93 scores of 50 plus with a batting average of 44.71 and a strike rate of 85.90 and Ponting has 28 hundreds and 74 scores of 50 plus with a batting average of 42.88 and a strike rate of 80.28. In terms of adaptability, Sachin Tendulkar as an 18-year-old on his first tour to Australia made two hundreds; a 148 not out in Sydney and the much talked about and unrepeatable 114 at the WACA in Perth. In subsequent tours Tendulkar has made four more hundreds in Australia to go with five scores of fifty plus; he averages 58.53 in Australia. He has never come back without a hundred from a Test tour and Brisbane is the only Australian ground among the ones he has played Test cricket on where he does not have a hundred. In 2003 he got a shocker from Steve Bucknor at Brisbane; and then despite being in decent nick that tour was a disappointment for the Little Master until he reached Sydney and accumulated runs with the ascetic discipline of a monk rather than the flourish of a genius; an unbeaten 241 and then a 60 not out salvaged his tour. Ponting, on the other hand, has had a miserable time in India and he got his first and only hundred in 2008; twelve years after his first tour in 1996. His average in India is a poor 20.85 and he has two fifties to go along with his only hundred. The home and away average of Ponting is 60.08 and 49.23 respectively but for Tendulkar it has been ‘equally-comfortable’ playing home or away with averages of 55.28 and 55.44 respectively. Clearly the Little Master is at home in all conditions.